Teak patio furniture from Java Indonesia. 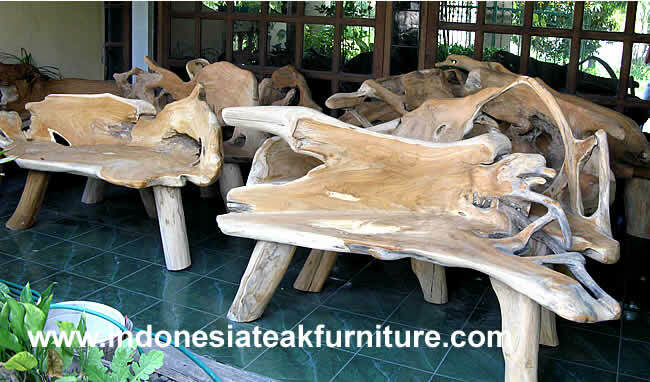 Teak tree wood stump furniture from Indonesia. We're able to supply you good quality teak root furniture in large quantity. Factory price ! Boat wood dining table furniture from Java Indonesia. Reclaimed wood furniture made of old wooden boats or Javanese houses. Dining room furniture with tables and chairs. Buy teak garden furniture direct from Java Indonesia from furniture manufacturer and furniture factory. Our company CV Maya is teak furniture company who produce and exports teak furniture for outdoor garden. Our teak outdoor furniture made of teak wood taken from teak root. Very strong, water and rot resistant, surely will last for generations. We also produce reclaimed boat wood furniture. 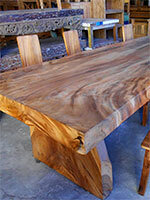 We make boat wood dining table and chairs. Furniture for dining room made of old wooden boat. Handmade in Indonesia.